How many days to visit Palermo? How to get to Palermo? 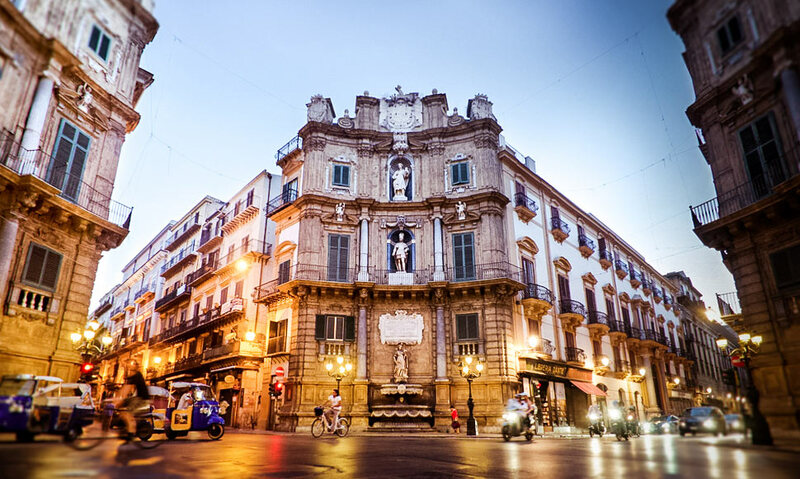 To visit Palermo, the capital of Sicily, is to discover an extremely rich city from a cultural point of view, with many places of interest not to be missed. In order to help you plan your next stay in the city, I’ve put together a short list of the 15 best things to do and see in Palermo. I then give you examples of itineraries to visit Palermo in 1, 2 or 3 days and, at the end of the article, the hotels offering the best value for money in the city! The Palazzo dei Normanni, located in Piazza Independenza, is the perfect representation of cultural interbreeding in Palermo. First built to accommodate Arab emirs, it was later occupied by the Normans who enlarged it, then not the Spanish. Today, it is the seat of the Sicilian Regional Assembly. The architectural style is very cosmopolitan and keeps traces of the different nations that inhabited it. To see especially for its courtyards and vast gardens as well as for the room of king Roger with multiple mosaics representing scenes of hunting. But the jewel of the Norman Palace is its Palatine Chapel, a masterpiece of Arab-Norman art. 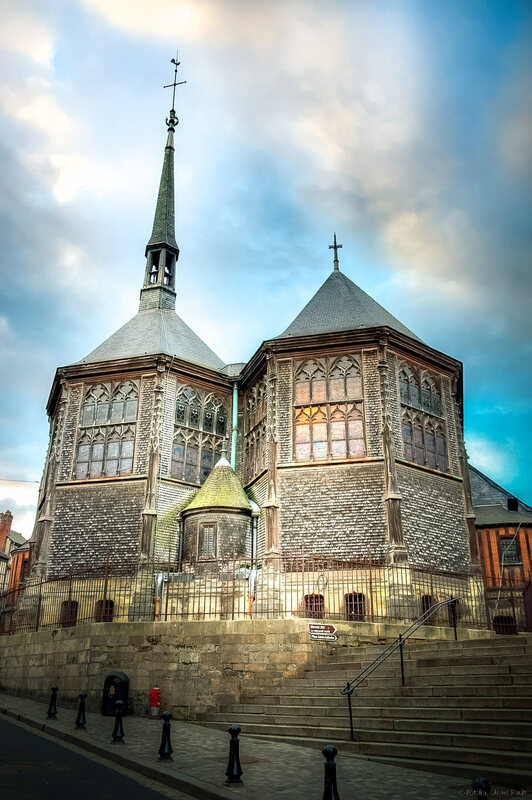 The chapel was built by King Roger for the purpose of hosting Masses for the Royal Family. 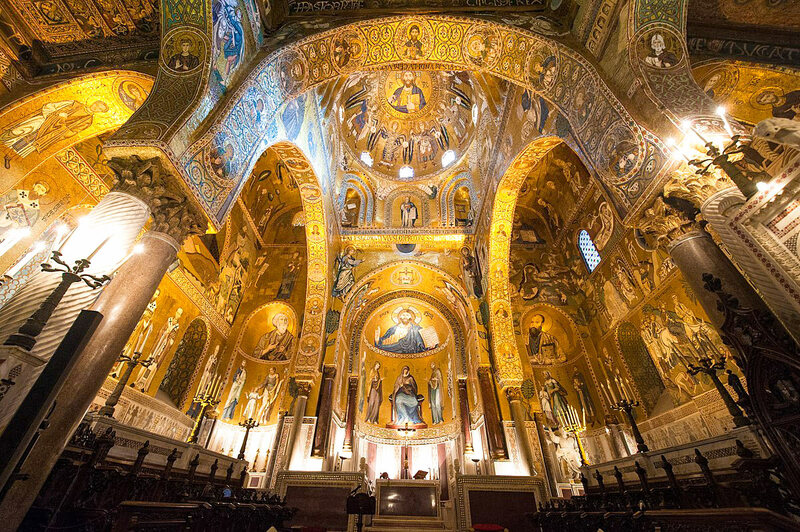 The beauty of the Palatine Chapel is its magnificent gold mosaics adorning the walls and ceiling. Rare for the time, some even represent human figures. 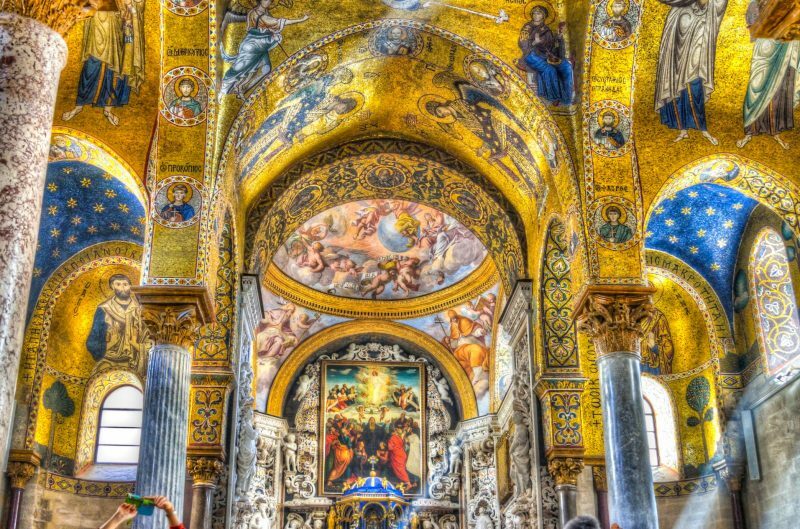 It is the most beautiful Byzantine chapel in Palermo and is considered by many to be the most beautiful church in Sicily. 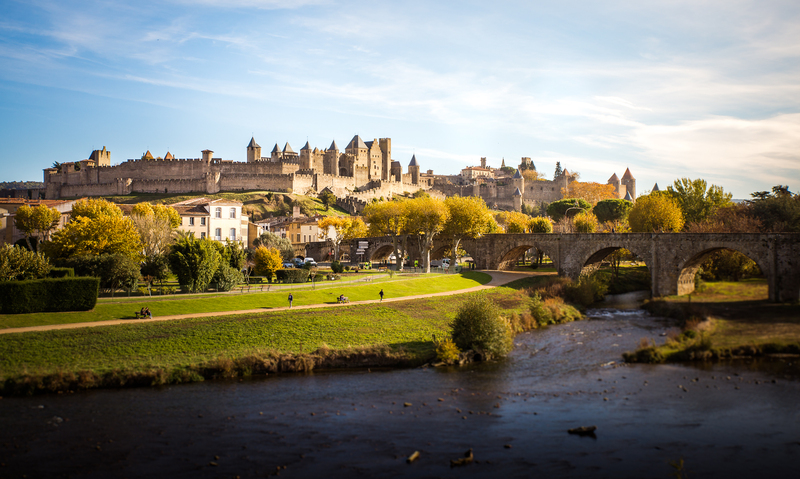 Right next to the Norman Palace, you can then visit the church of Saint Jean des Ermites, a medieval Norman church. 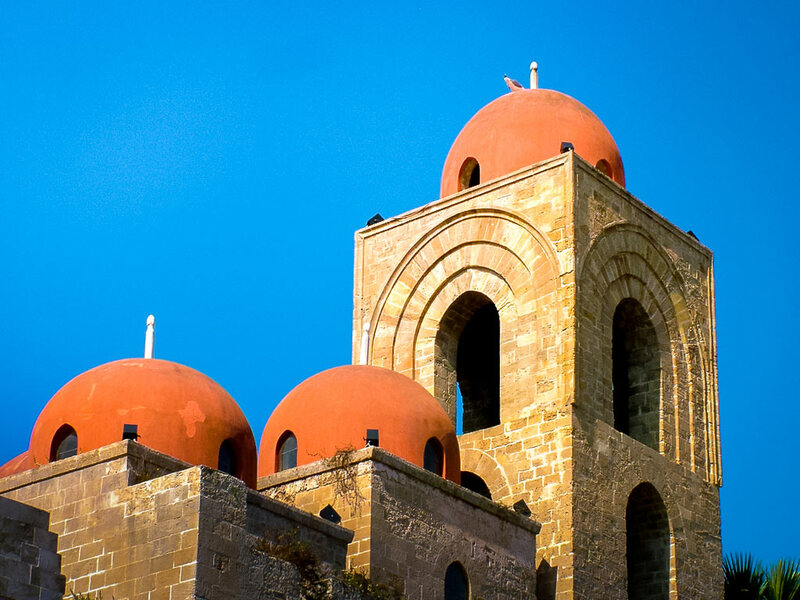 Famous for its bright red domes visible from the outside, the interior is also worth a look. The cloister and the gardens are really beautiful and, after the hustle and bustle of the city, they are a good destination for a moment of relaxation and calm. The church itself is very simple but shows a clever blend of style between Muslim art and Norman. We found the entrance a little expensive for what to see (6 €), but even if you do not want to visit the interior, do not hesitate to see it from the outside, it is everything likewise very photogenic. Not far from the Norman Palace, go up Via Vittorio Emanuele and you will find the second most emblematic place of interest to see in Palermo, its cathedral. From the outside, the cathedral is simply beautiful. I was particularly impressed by this imposing building and its architecture, which, as for the Norman Palace mixes different styles. Inside you can visit the crypt which houses the tombs of kings and queens including that of King Roger II. This is also where the treasure is, a collection of royal jewels from the 12th century. Do not miss to climb the rooftops of the cathedral to admire a beautiful panorama of the whole city of Palermo. You know, at BonAdvisor, we like to walk through the market stalls to discover local specialties and especially to taste them! 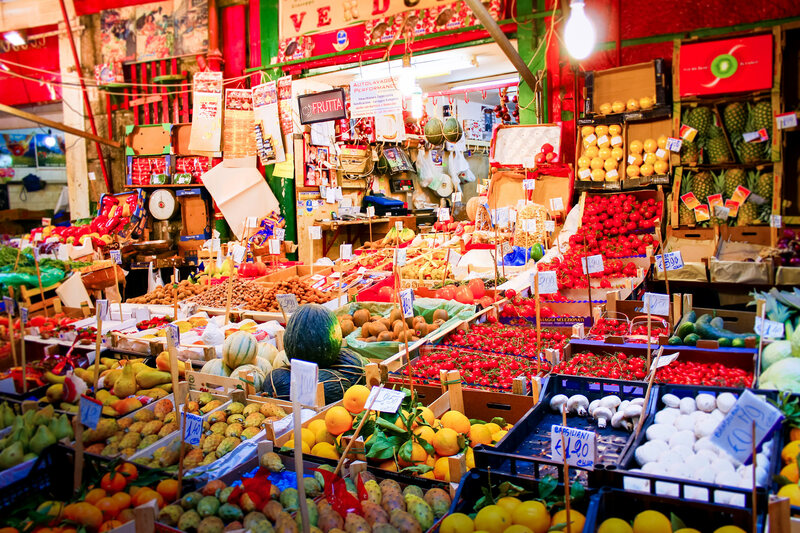 In Palermo, we recommend you to walk the market stalls of Ballaro, one of the largest and most typical of the city. This market, very colorful and especially very well stocked, presents a selection of the best products of the region be it fruits and vegetables, cheese and of course fish. And all at unbeatable prices! Once past the food stalls, you will also find vendors of dishes and electronics, and all sorts of junk. The Quattro Canti crossroads, “four songs” in French, marks the intersection of the two main streets of Palermo, Via Vittorio Emanuele (the street where the cathedral is) and Via Maqueda that leads to the Massimo Theater . When you visit Palermo, make a turn at this crossroads to admire the perfectly symmetrical 4 facades that comprise it is unavoidable. 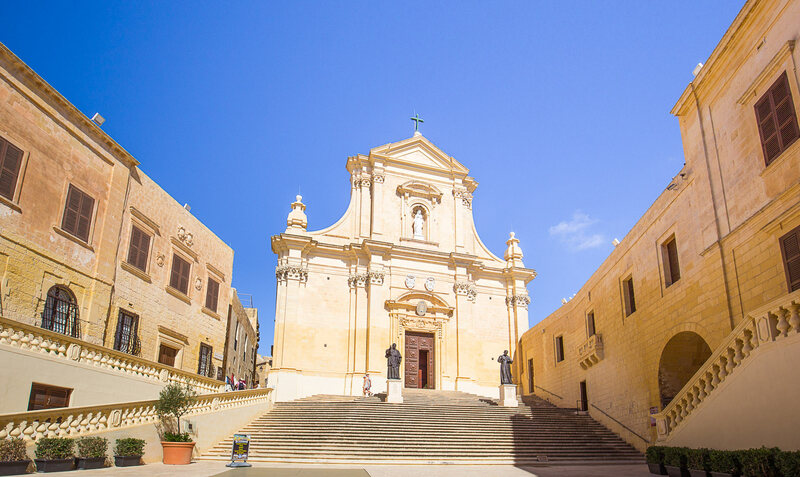 All four are built according to the same model: at the base, a fountain representing the seasons ; on the first level, the statues of the kings of Palermo and on the last level, the representations of the four patron saints of Palermo . If you had the chance (like us) to visit Rome, the Quattro Canti will not be without reminding you of the place of the four fountains which it is largely inspired. The Massimo Theater was inaugurated in 1897 as the greatest opera house in Italy and the third in Europe just behind Paris and Vienna. His greatness was also much talked about at the time, some wondering if Palermo really needed such an opera! It quickly becomes one of the most famous theaters in Italy, especially for the prestige of the works that are played there. Closed in 1974, it only reopened in 1997 after 23 years of work against a backdrop of political scandal and corruption. Today the theater continues to host very large operas. For those who can not afford a ticket for this experience, the theater also organizes guided tours every day. Several packages with backstage access or not are offered. Count about twenty euros for the complete visit with the possibility to access the terrace of the opera for a 360 degree view of Palermo. The ghost of the superior mother of a monastery, which had been destroyed to build the theater, would haunt the place. Do not panic, she would just pawl on the stairs! So did you stumble when visiting the opera? The Regional Archaeological Museum of Palermo is located not far from the Massimo Theater in an ancient palace. On 3 floors, it houses an impressive collection of Etruscan, Roman, Egyptian and of course Greek,including elements from the excavations of the site of Selinunte. The works are very well developed and the setting is particularly pleasant because the rooms are located around 2 shady courtyards with exotic trees and refreshing fountains. A perfect place for a quiet cultural visit! Note that admission to the museum is free so no excuse to deny it! Another museum to visit in Palermo, the Regional Museum of Sicily. It is located in the Palazzo Abatellis, a Gothic-style palace in Catalonia, in which Francesco Abatellis, the port master of Sicily, used to live. 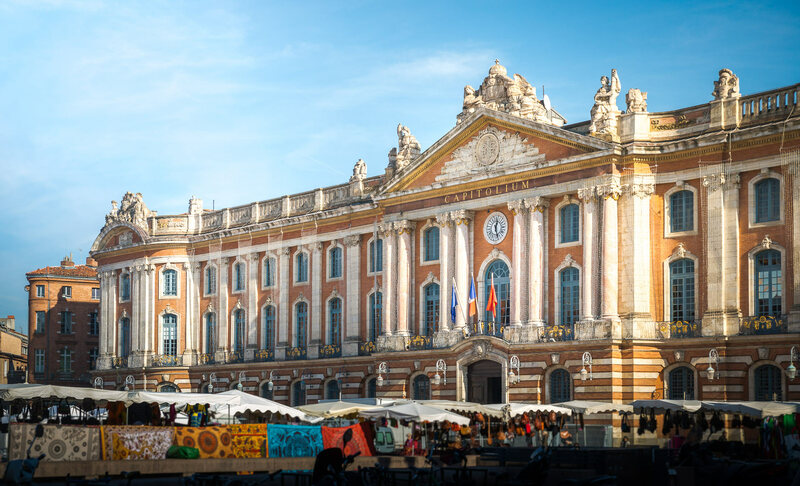 The regional museum presents an important collection of paintings, statues and frescoes. To see: the fresco of the “Triumph of Death” (anonymous work), the painting of “the Virgin of the Annunciation by Anthony of Messina, the bust of Eleanor of Aragon and the triptych” Malvagna “painted by Mabuse . The Foro Italico is a large green area located by the sea. It’s the perfect place to take a break away from the hustle and bustle of downtown Palermo. The place has been landscaped with a seaside promenade and some trees to enjoy a little shade. I also recommend it if you have children because it has a playground and they can also play ball and stretch their legs. What to satisfy everyone in short, before setting out again to discover the historical monuments of Palermo. 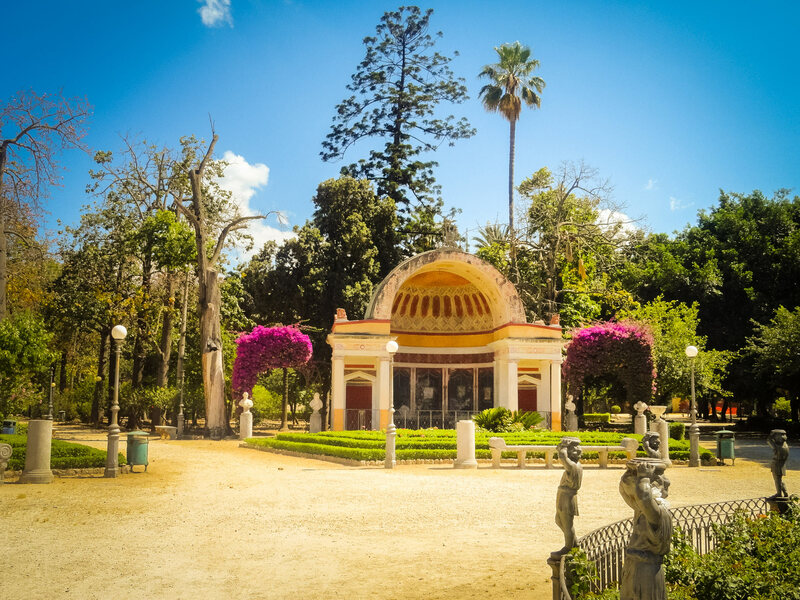 To continue in quiet and green, you can also visit the Botanical Garden of Palermo, located near the Foro Italico , via Lincoln. Stroll through the shady alleys to enjoy the coolness. The botanical garden is home to several species of Mediterranean and exotic trees and plants, many fruit trees such as orange and lemon trees and greenhouses. Do not miss the giant ficus with intertwined branches, the most famous tree in the garden. Note that the entrance fee (5 € normal fee) and the botanical garden is still a bit of maintenance. 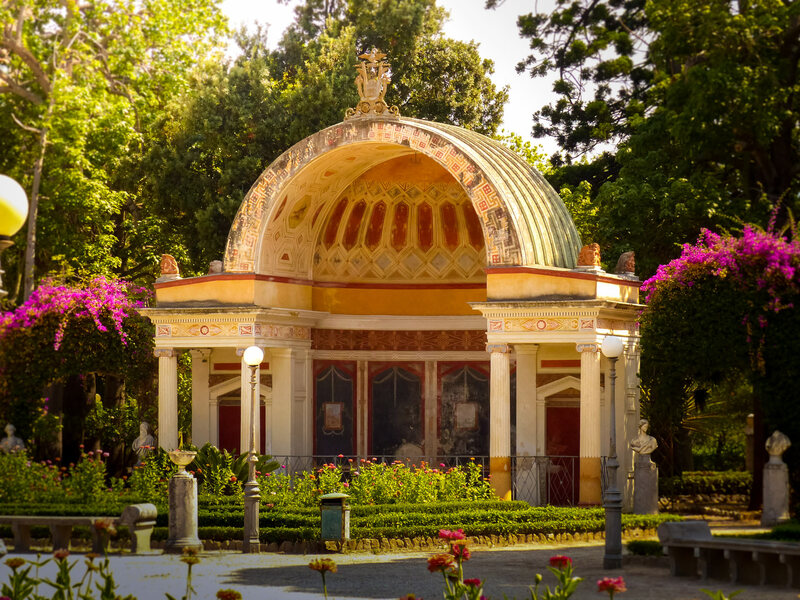 If you do not want to pay for the botanical garden, but still want a little cool, you can go to Villa Giuilia, whose gardens are adjacent to those of the Botanical Park. Access is free and is very popular with palermitans. It is a beautiful public garden with statues and fountain and many benches to rest. At the bottom of the garden, you will even find a small café to quench your thirst. This is the unusual visit and not to miss during a stay in Palermo: down in the catacombs of the Capuchin monastery. Originally only the monks could benefit from an interment in the crypts of the Capuchins. 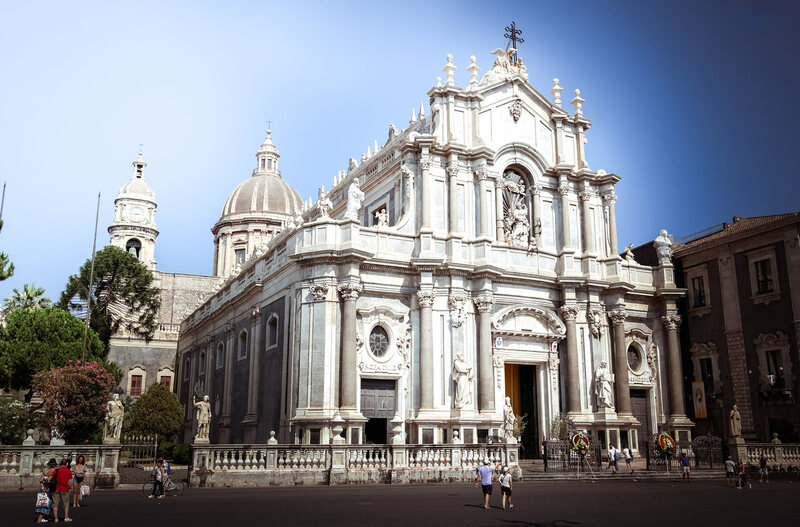 But as time passed, many Sicilians, mostly from noble families asked to be buried there. Through a process of dehydration and embalming the bodies were very well preserved. In their will, the deceased even chose in which clothes they wished to be kept. Families could visit them and donate to the monastery so that the monks could maintain the bodies. Thanks to his gifts, the catacombs have been maintained for centuries. Today the catacombs have nearly 8,000 mummies and are divided into several sections: monks, women, men, children, etc. The visit is particularly impressive because most are presented hanging on the walls and still extremely well preserved. 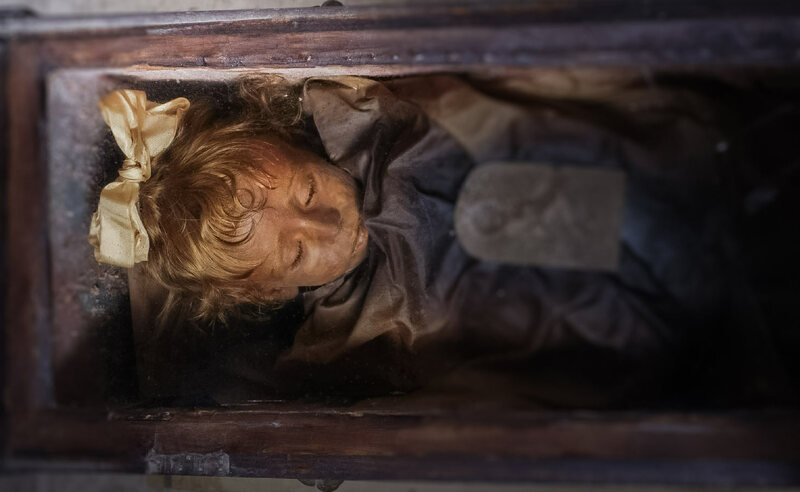 The best-known mummy and one of the best preserved in the world is that of young Rosalia, a 2-year-old girl who died of pneumonia. It gives the impression of being sleeping so much the face and the hair has been well preserved. It is recommended not to go with young children. The photos are prohibited so as not to degrade the place. 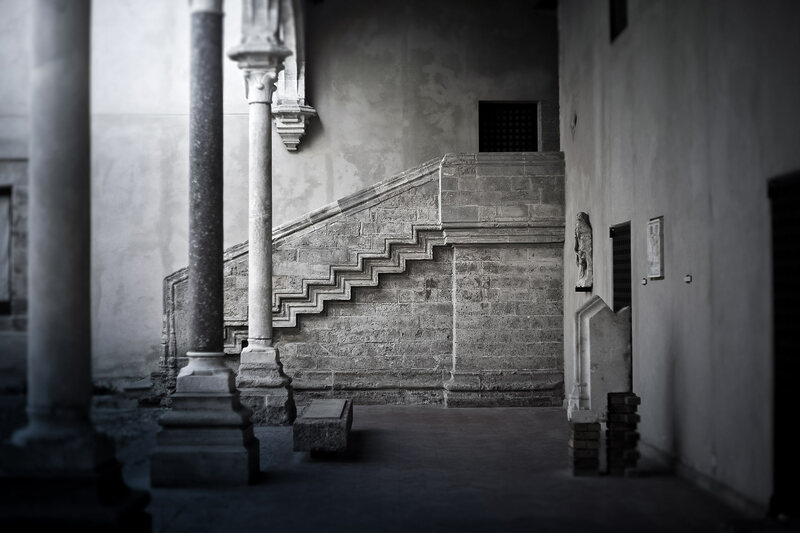 Besides the Norman Palace, the city of Palermo is full of many palaces to visit or just admire. Some are more or less well preserved. 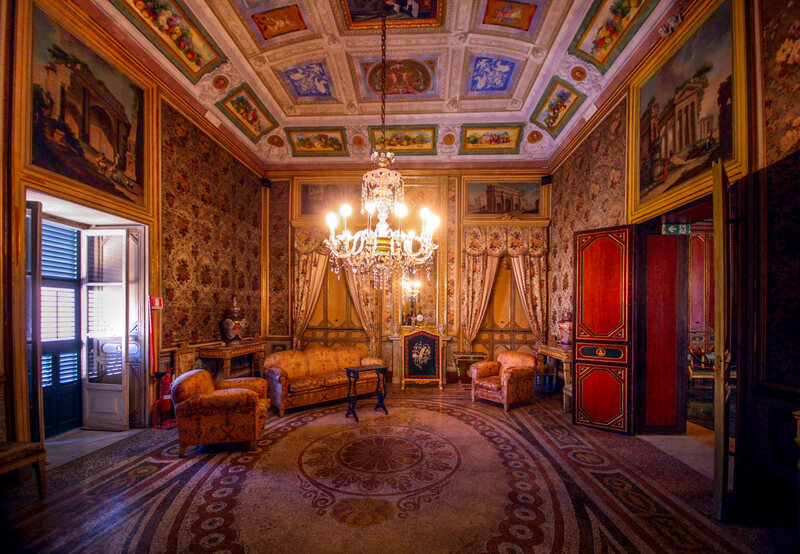 The Gangi Palace: Sumptuous palace where was filmed “The Cheetah” of Visconti. 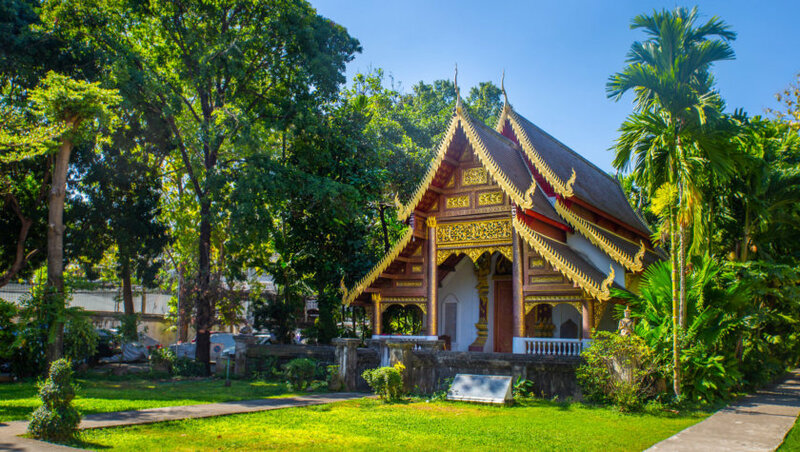 Still inhabited by the princely family, the palace has retained all its splendor of yesteryear. Attention visit only on reservation and in groups of minimum 20 people. The Chiaramonte Steri Palace: The palace is reputed to have become the headquarters of the Inquisition Court for more than 150 years. You can discover the cells of the prisoners covered with graffiti made with their blood and their urine and have explanations on the processes used for the torture. Mirto Palace: splendid palace with authentic decoration and original furniture. Lets imagine the way of life of a wealthy Palermo family of the eighteenth century. The palace of Zisa which houses the Museum of Islamic Art. To see especially from the outside because the interior is a bit empty. 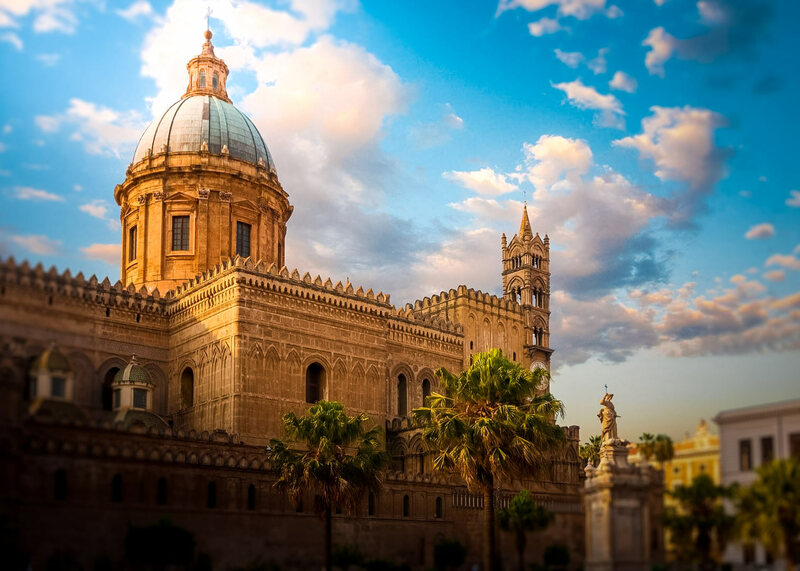 If you like visiting places of worship, then Palermo is for you with its countless churches. 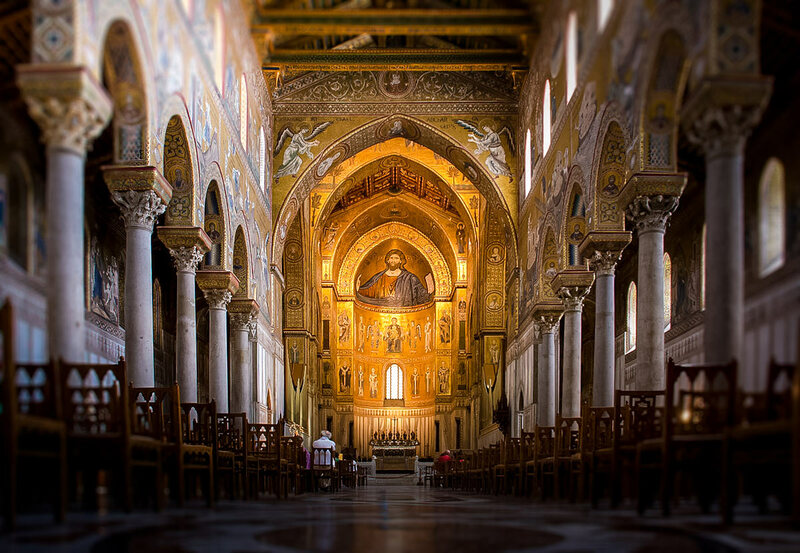 If you are staying for a few days in Palermo, a visit to Monreale Cathedral is a must. 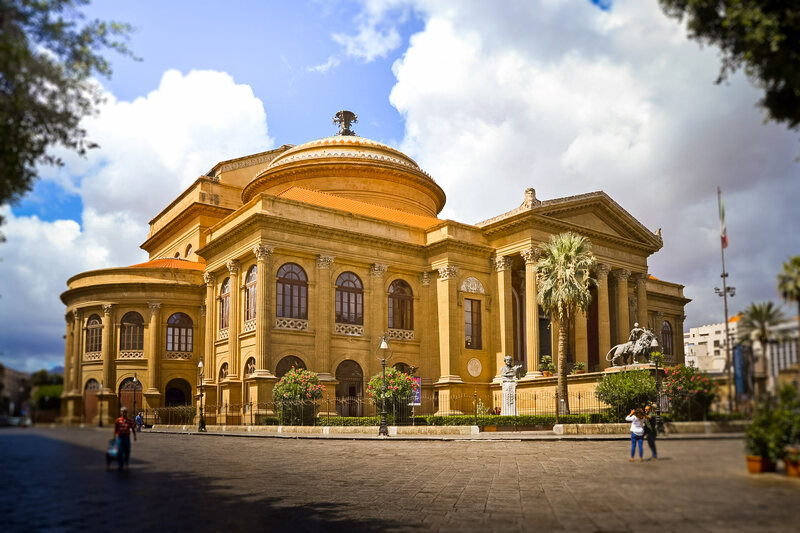 It is located 40 minutes drive from the center of Palermo and it would be a shame to miss out on your tour in Sicily. Listed as a UNESCO World Heritage Site, it is a masterpiece of architecture both outdoors and indoors. Arab-Norman style, the exterior has two towers, one destroyed by lightning. Admire also the Gothic portal and the bronze doors, magnificent architectural work. But the most beautiful of surprises lies inside the cathedral. 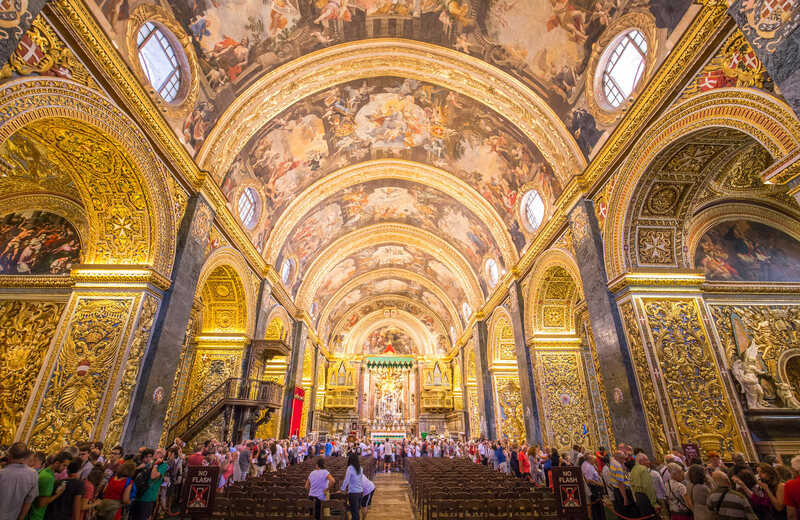 More than 6,500 square meters of golden mosaics depicting scenes from the New and Old Testament will surely amaze you. Adjoining the cathedral, also admire the cloister composed of several columns, each with unique decoration. At the end of the visit of the cathedral, I advise you to take a tour in Monreale to enjoy some beautiful panoramas. After all these historical and cultural visits, I suggest you take a short walk to the beach. Ares all you are also in Sicily to enjoy the joys of the sea right? 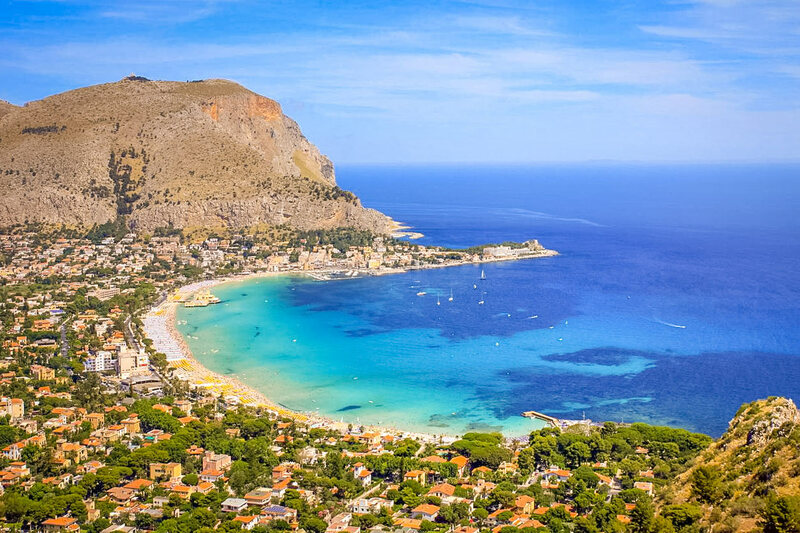 From Palermo you can reach Mondello Beach, a 30-minute drive away. With its fine sand and clear water, it is the favorite beach of the palermitans. You will find plenty of rental chairs for the day but there is also a free public part where to put your towel. A multitude of restaurants and snacks to eat and refresh. Well we prefer to warn you, you will not be alone! On the other hand, with its shallow water, it is the ideal place if you have children. This is a question that many travelers ask themselves. Personally, I advise you to do at least 2 nights in Palermo during your trip to Sicily, just to have 2 full days in the city. If you want to have the time to visit Palermo and its surroundings, I recommend you spend 3 days in Palermo. Enjoy a relaxing afternoon at the Mondello beach : fan- shaped toes, swimming in a warm and transparent water, ice break, you’re not there? A casa di Amici: Located 1km from the cathedral, this hostel offers beds in dormitory from 20 €, breakfast included. The most: the location, the terrace, the cleanliness and comfort of the beds and common areas. Due Passi: B & B located 500 meters from the Massimo Theater. Modern and bright double room from 63 € per night, breakfast included. Most: very nice area, B & B well located, the welcome and availability of guests, calm and very good breakfast. This is our favorite report performance / price. Alma Hotel: Located 450 meters from Massimo Theater and 1.5 km from Palermo Cathedral. Double room very modern and design from 100 €, breakfast included. What’s more: lovely owners and good advice, quality rooms, exceptional homemade breakfast with lots of cakes. Porta Di Castro: Located in the historic center of Palermo, 5 minutes walk from the cathedral. Double room beautifully decorated from 150 € per night, breakfast included. The most: the exceptional location, the hotel and its original decor, the rich and varied breakfast, the lovely staff. This is our recommendation for a luxury stay in Palermo. Lo Scrigno dei Sapori: Located in Piazza Principe di Camporeale, 150 meters from the Palazzo de la Zisa. Typical Sicilian cuisine excellent and plentiful. Fresh produce and sinned fish of the day. Excellent value. Do not rely on the outside or the slightly kitsch room, the restaurant hides a nice indoor garden to spend a pleasant evening. Torquemada: Located in Via Pignatelli Aragona, 200 meters from Regional Archaeological Museum. This restaurant offers a wide choice of dishes, from pizza to pasta or fish. All are hearty and excellent at a price more than correct with bonus limoncello offered at the end. Note that the place is however quite noisy because very large. 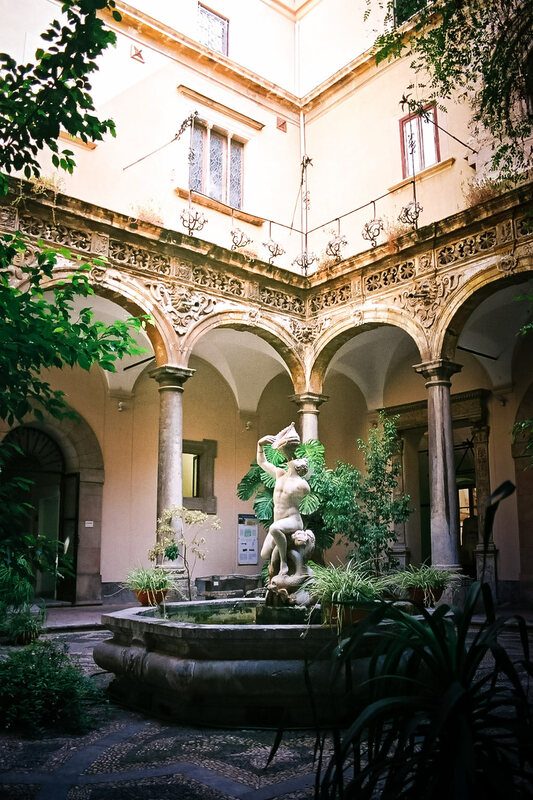 Al fondaco del conte : Located in the historic center of Palermo, in Piazza Conte Federico. Small restaurant, quiet, offering a delicate and refined cuisine. The appetizers are offered, the dishes are tasty and made with quality products and the desserts are original. All for a reasonable price, we can only recommend it. To help you visualize the city a little better, I made you a tourist map of Palermo listing the places to visit I’m talking about in this top 15 things to do in Palermo. You can display the legend of the map by clicking on the button at the top left with a small arrow. For this you can use our flight comparator, in partnership with Skyscanner. It’s the assurance of getting the best price. And you, what did you prefer during your stay in Palermo? Cheap Travel to Sicily: 1,2 & 3 days Itinerary + All our advices!